Complete service provider for property damage repair, inspection and testing services for water damage, mold, asbestos, lead, and other contaminants or situations. 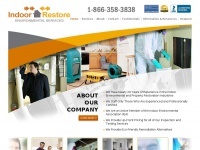 The websites creator or author is Indoor-Restore. 1993-2013 indoorrestoreca.com, All rights reserved. No exceptions is the owner of the copyright for this website. The web server used by Certifiedmoldinspectors.biz is run by 1&1 Internet and is located in Wayne, USA. There are many websites run by this web server. The operator uses this server for many hosting clients. In total there are at least 100 websites on this server. The language of these websites is mostly english. A Apache server hosts the websites of Certifiedmoldinspectors.biz. XHTML 1.0 Transitional is used as markup language on the webpages. Indexing the data of the website and following hyperlinks on it is explicitly allowed by robot information.